The online programme with oral sessions and poster allocations can be found here. O ver the previous decade, there have been important achievements in the field of prevention science. Our understanding of the development of health and social behaviours, and refinement of new research methodologies, quality standards and programmes, has allowed us to better respond to the needs of target populations. Most European countries now deliver some form of preventive actions across different policy domains, although some actions are less well developed than others. However, implementation science (the study of methods that influence the integration of evidence-based interventions into policy and practice settings) is relatively under-utilised in Europe, and little centralised attention has been paid with regards to which interventions and components prevention strategies comprise, and how they are organised and delivered. Literature reviews and systems mapping, for example, suggest that effective interventions are in the minority of those that have been evaluated, and that these effective approaches are rarely implemented in practice. Furthermore, where effective programmes have been identified there are also concerns over adaptation and transferability to other cultures and geographies, and it is often difficult (and costly) to implement prevention programmes at a scale that would have an impact outside the confines of a research trial or local development process. Sustainable prevention actions require responsibilities for policy and actions to be held across multiple ministries or departments that address the needs of the public, and given that programming is delivered across a spectrum of organisational settings, prevention systems need to be inclusive of representative stakeholders including citizen groups, and delivered across multiple levels of society. Prevention also requires committed and long-term funding and strong supportive regulatory systems, and trained prevention practitioners and researchers to ensure high quality implementation. This has meant that whilst we are better able to understand the quality and effectiveness of individual prevention actions, particularly those embedded in research projects, it is uncertain whether the same level of quality is mirrored in the ‘real world’, and what the key facilitators and barriers to improving system-wide quality are. How can we improve the organisation of ambitious integrative actions that promote partnerships between researchers, practitioners, policy makers and the public? How has our understanding of quality in prevention science developed, and how influential might initiatives such as the SPR standards for evidence for efficacy, effectiveness, and scale-up research be? What does ‘high quality’ training and education in prevention look like? What is the role of ethics in supporting the development of the prevention field? How best can we promote the use of evidence in policy and practice whilst supporting diversity and innovation? What do researchers and practitioners need to know in order to influence the policy making process, and should we be realistic about what we can achieve? How has the field responded to quality standards and guidelines in prevention with respect to research priorities and practice? How do we improve the identification and implementation of evidence based prevention programmes and actions? What are some of the key methodological and conceptual developments that will advance the prevention field? EUSPR conferences attract a diverse group of participants, not just from Europe, but internationally. In addition to academics and researchers, policy and decision makers, practitioners and prevention coordinators are well represented and will benefit from attendance. We hope that you are able to join us at this year’s conference. Vienna has played a central role in European history, and boasts one of the world’s oldest Universities. Modern Vienna is cultured, dynamic, and is rich in music, architecture, arts and shopping. 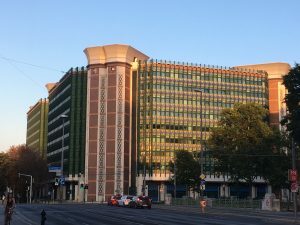 It is a truly international city, and hosts the United Nations at the Vienna International Centre (including the UNODC, holding responsibilities for drugs and crime). The full programme will be published in due course. Pre-conference workshops (for registered attendees) begin at 9:00 on September 20th . 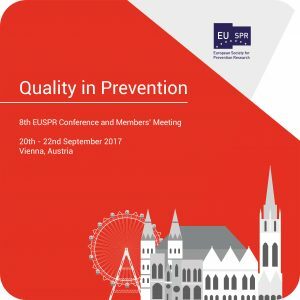 The EUSPR Members meeting (for Society members), begins at 16:00 on September 20th . For the main conference, registration is between 8:00-09:00 on the 21st September, with the opening address commencing at 09:00. The conference will formally close at 18:00 on Friday 22nd. We welcome submissions on the main conference theme, but as always, abstracts on all prevention science related topics are encouraged. We also encourage presentations that focus on improving the use of evidence in policy and practice and welcome delegates from outside of academia who have an interest in prevention science. Dedicated parallel sessions will be held to provide PhD students and Early Career delegates opportunities to present their work in a supportive environment. Plenary sessions will be held in the centre of Vienna, at the Federal Ministry of Health and Women’s Affairs (Map). Please see their website for further details. Additional meetings and parallel sessions will take place a short walk away in the offices of Gesundheit Österreich GmbH (Map). We are very pleased that the 2017 conference is co-organised and supported by the Austrian Federal Ministry of Health and Women’s Affairs and Gesundheit Österreich GmbH (GÖG), the Austrian Public Health Institute. The conference proceeds in collaboration with the Public Health Institute (PHI) at Liverpool John Moores University, UK; the State Agency for Prevention of Alcohol-Related Problems, (PARPA), PL; and The Dartington Social Research Unit (DSRU), UK.